The luck of the Irish be with ye! Welcome to our Tax Season Interns! Calendar-year corporation tax deadline is March 16. IRS issues regulations for Alternative Simplified Research Credit. Penalty relief for certain small employer health care plans. Most small businesses excused from filing change of accounting method form for repair and capitalization rules. California exclusion for cancellation of residential debt not yet extended. Visit our new articles: The Seven Forces of Success book review. 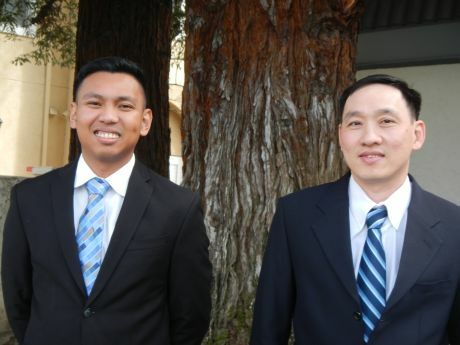 Our interns this Tax Season are Jay Panergo and Tam Bui. St. Patrick's Day is Tuesday, March 17. It's the day of the year Americans like to be Irish. It's the day for "the wearin' of the Green," drinking Guinness and eating corned beef and cabbage. It's interesting to know that corned beef and cabbage isn't popular in Ireland. It was "poor people's food" brought by the Irish immigrants to the United States, mostly during the Potato Famine. Like many immigrant groups, the Irish weren't initially welcome in the United States, but they are now well assimilated Americans. The Irish in Ireland are very proud that John Kennedy was a President of the United States of Irish descent. By the way, the symbol of St. Patrick in Ireland is the three- (not four!) leaf clover. St. Patrick used the three-leaf clover as an analogy for the Holy Trinity. It's tax season! Before we know it, it will be April 15! Our clients should have received their organizers and many have already brought their tax information to us. If you bring your information after March 15, plan on having an extension done. After being away for a month recovering from surgery on her wrist, Dawn Siemer returns today. We are happy and relieved that she will be here for the rest of Tax Season! Our tax return preparation interns working with us this Tax Season are Jay Panergo and Tam Bui. Jay graduated from San Jose State University with a Bachelor's Degree in Accounting in May 2014. He is a Nutrition Care Specialist in the U.S. Army Reserve. Jay is originally from the Philippines, came to the United States in 2009 and is now a U.S. Citizen. Jay enjoys hiking and running. Tam graduated from San Jose State University with a Bachelor's Degree in Accounting in December 2014. He previously received a Bachelor's Degree in Accounting from the University of Economics in Saigon, Vietnam. Tam is originally from Vietnam, came to the United States in 2005, and is now a U.S. Citizen. He is married to Doan Le and has two sons, Anthony and Timothy. Tam enjoys playing soccer. The due date for income tax returns of calendar-year corporations, including most S corporations, is March 16. Hopefully these businesses have already submitted information to their tax return preparers for preparing their income tax returns and extensions! The IRS has issued final regulations for the Alternative Simplified Research Credit (ASRC). Under the regulations, taxpayers may elect the ASRC on an amended income tax return. See your tax consultant for details. IRS gives penalty relief for certain small employer health care plans. Great news for small employers that reimbursed their employees for the cost of individual health coverage during 2014! The IRS has announced it will waive the $100 per day, per employee penalty for violating rules under Health Care Reform under Internal Revenue Code Section 4980D in this situation. The penalty, which could be $36,500 per applicable employee is very onerous. Many tax return preparers will also be relieved that they won't have to give this terrible news to their clients. The employers that qualify for the waiver aren't required to file IRS Form 8928 for 2014. The relief doesn't apply to "Applicable Large Employers." The IRS is providing this relief to give small employers time to either discontinue the practice of paying for individual medical insurance for their employees or putting a qualified group health plan in place. The waiver applies to payments up to June 30, 2015. The IRS has announced relief in Revenue Procedure 2015-20 for small businesses and real estate investors relating to its new rules for repairs, materials and supplies, and capitalization. Small business taxpayers with total assets of less than $10 million and average annual gross receipts of $10 million or less in the three years preceding 2014 (2011 - 2013) won't have to file a change of accounting form, Form 3115, for 2014 after all. The new rules will generally only apply for small business taxpayers to expenses incurred starting in 2014, and not retroactively as previously announced. The change of accounting will still be required to be made in statements included in the 2014 income tax return. Some small business taxpayers still might decide to file the change of accounting method form if they want to take advantage of a new rule to claim a tax deduction for the undepreciated cost of a part of a building that was replaced, such as a roof replacement. Small business taxpayers and real estate investors should still consult with tax advisors familiar with the rules to understand them and to make necessary elections on their 2014 income tax returns. Tax return preparers and taxpayers will all have a sigh of relief from this announcement. This announcement will also save a forest for the mountain of paper forms that would have been required to be sent to the IRS and reduce the number of extensions for 2014 income tax returns. We should all thank groups like the American Institute of Certified Public Accountants that tirelessly worked with the IRS for this modification of the requirements. The federal government recently extended the exclusion from taxable income of cancellation of debt for acquisition or improvement of a principal residence through 2014. California has had different limitations for the exclusion and hasn't yet conformed to the federal change. California taxpayers who had a cancellation of debt for the acquisition or improvement of their principal residence should consider extending the filing date for their 2014 income tax returns, because California has conformed to the federal dates in the past. Alternatively, the taxpayer might qualify for the insolvency exclusion. April 3 and 10, 2015, James Brown, ASA, CFO®, Perisho, Tombor & Brown, PC, "The role of the business valuation specialist"
April 17 and 24, 2015, David Howard, CPA and attorney at law, Loomis & Co CPAs, LLP, "Foreign account reporting update"